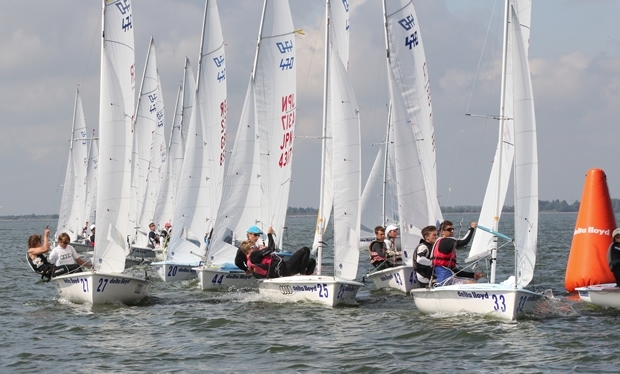 Despite some strong late challenges from British crews, Sweden and Germany held on to become the winners of the Delta Lloyd Junior 470 World Championships after two great Medal Races today in Medemblik, Holland. It has been a week of first too much wind, and then too little, but finally the breeze came good for the Medal Races that would decide the winners of the 60-boat Men's/Mixed fleet and the 32 Women's teams. With 10-12 knots of wind blowing, flag ‘Oscar’ was flying, allowing the crews to put in every kinetic effort and extra propulsion into the boat that they could muster. Neither the Men's nor Women's series leaders made easy work of it, but Nicklas Dackhammar and Fredrik Bergstrom held on for Men's gold, and last year’s Junior silver medallists Annika Bochmann and Anika Lorenz went one better to clinch this year’s Women's Championship. British team Phil Sparks and David Kohler had been the form team in the early phase of the regatta when the wind was up, but then dropped out of Championship contention as the breeze disappeared later in the week. Today they reminded everyone, including themselves, of what they’re capable of. They blasted out from the pin end, hit the left-hand corner, tacked and comfortably crossed the fleet, winning the race unchallenged. For their efforts they clawed their way back on to the podium, taking bronze. The Swedes could only be beaten by one team for gold, so they focused their attentions on French sailors Kevin Peponnet and Julien Lebrun in a tense match race. A tacking duel ensued all the way up the first leg, and they rounded at the back of the pack, with the match race continuing until finally the French broke clear. If they could get four boats between them and the Swedes, the French would take gold. While climbing back up to 7th was pretty good, with the Swedes still at the back in 10th, it wasn’t enough to get past Dackhammar and Bergstrom who performed excellently through all the varied wind conditions this week. In the Mens/Mixed silver fleet, Piotr Ogrodnik and Pawel Choroba of Poland won the final fleet race, moving up to 3rd overall. A 3rd place in today’s race moved Frances’ Hugo Feydit and Pierre Rhimbault into 2nd overall. Despite a 15th place today, no one came close to threatening the Slovenian grip on silver fleet, Andra Gulia and Jakob Bozic going on to win the division easily. Mirroring the strong British performance in the Men's Medal Race, Brit girls Anna Burnet and Flora Stewart turned on the speed and won the Women's Medal Race. "Winning the medal race was amazing. It was a really good way to finish the regatta,” said Burnet. The Germans, Annika Bochmann and Anika Lorenz, started the Medal Race badly, and had some catching up to do. Although with their closest rivals - the Australians - also at the back, the gold was never under much threat. “The medal race was a little bit stressy. We had a bad start and some problems with the speed but then we managed to keep our place on the downwind,” said Lorenz. “Now we are just so happy, happy because we won!” Last year’s runners-up in Qatar have converted silver to gold. All the sailors will agree that the teams that made it on to the podium in Medemblik this year are true masters of the 470. The past seven days have tested them in all winds from 0 to 30 knots, from flat calm to steep chop.